Cook together 1 – 1 1/2 hours. Remove skin. Cool in fridge. Fat will rise to top. Remove all but 3 or 4 tablespoons. Swanson broth, add if needed. BAH Note: In a perfect world, I’d give you an exact quantity of water to use. If I were a betting woman, I’d say we used about a 6 quart pot and had between 4 and 5 quarts of water in there. But don’t hold me to that. Also, if you don’t want to wait a day to eat the soup, much of the fat can be carefully skimmed off the top of the warm broth and the noodles added immediately. The time for the noodles to thoroughly cook in the broth remains unchanged. Don’t be alarmed when the soup goes cloudy and get a little bit thick after you add the noodles. 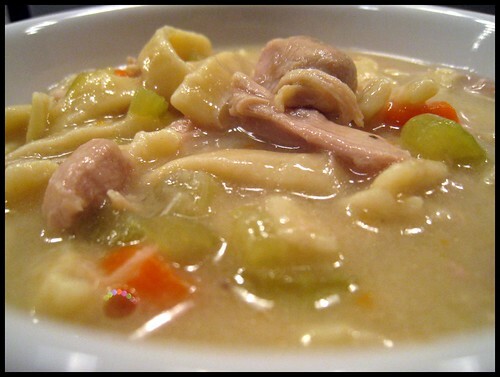 Place chicken thighs, bouillon cubes, and diced vegetables in a large stock pot or dutch oven. Add enough water to fill the pot about 3/4 full. Bring to a boil and lower to a simmer for 1 to 1 1/2 hours, until chicken is done. Carefully remove chicken from the liquid and let cool until it can be handled. Remove and discard the skin. Shred the chicken off the bone and add the meat back to the pot. Add a can or two of chicken broth if desired, taste for seasoning, and add salt and pepper to taste. Let the soup cool and then refrigerate. Once thoroughly chilled, remove most of the fat that has risen to the top, leaving just a bit for flavor. Reheat on the stove, adding handfuls of homemade noodles. Allow the soup to simmer for at least 20 minutes for the noodles to cook through. Beat an egg in a medium mixing bowl. Add flour, about 1/4 cup at a time, and mix to combine until the dough comes together. The dough should be a little on the dry side. Turn the dough out onto a floured board and roll into a thin sheet with a floured pin, being sure to pick the dough up and dust the board with additional flour as needed to keep things from sticking. Allow the dough to sit on a kitchen towel or newspaper until it is fully dried. 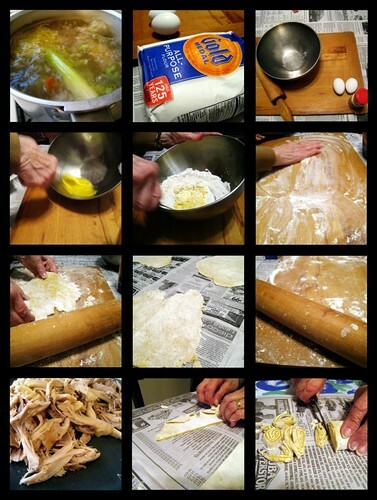 Carefully roll the dough up and thinly slice off noodles. Separate the noodles into individual pieces. Unused noodles can be sealed in plastic bags (with all the air removed) and frozen for later use. ahh chicken noodle, one of my all time favorites. I wish I was home eating a bowl right now. maybe sometime this weekend! Beth, I think this weekend’s forecast is ideal for whipping up some chicken soup. Elizabeth, the noodles were easy enough to make when I was in the presence of the master. I fear that when I go to make them again at home, the results won’t be quite as awesome. Since I’ve had them now, I love homemade egg noodles. So yummy. My grandma’s chicken soup was simple like that too, but instead of ground pepper, she threw in a good handful of various types of peppercorn – there were huge ones and tiny ones and every size in between and I usually ended up biting into at least one of them while eating the soup. Mouth on fire is not fun for a little girl. Rarely would she make homemade noodles. I think Mueller’s egg noodles were her usual, but there was also a packaged noodle we found called “kluski” (noodle in Polish, don’t remember the brand) that were even better and tasted like freshly dried homemade noodles. Whole peppercorns? No, biting into those is no fun. I love Mueller’s egg noodles. We always had a bag of them around the house. Topped with some melted butter….heavenly. Oh my gosh–those old recipes! You gotta love them. They just assume you can cook! TKW, it gets better. I’m going through my recipe folders and breaking up with things that I’m just never going to make. Buried in there were parts of old cookbooks (circa 1940’s or 1950’s) that my grandmother had given me at some point. These things are a hoot. But you better believe that I’m going to try some of them out.